This is probably my favourite Professionals episode. Admittedly lack of Doyle but Bodie is on top form throughout, accompanied by Gabrielle Drake. Another all-action thriller but this time, we have Bodie without Doyle as he captures a wanted terrorist leader, ruining any plans he had with his weekend lover Julia. This has been compared by some to Die Hard, but it's more like a Home Counties version of Assault On Precinct 13 with Bodie and Julia taking refuge inside a cottage house which then comes under fire from their prisoner's gang. Lewis Collins does a remarkable job balancing menace and rage with dark humour as he plays a beleaguered Bodie and the most hair-raising part is when Inge and Hans manage to smash into the house. OK but relies too much on coincidence with Bodie just happening to be in the same part of the countryside as the terrorists. That's true, but it does help bring the story forward as we saw the terrorists in the beginning and Bodie stares at Myer's photo after the meeting has finished. I think this was a showcase for Lewis Collins to carry the show on his own as in previous episodes, he was with Doyle. This was one of the highest rated episodes of the series, gaining over 17 million viewers in January or February 1978. A cracking episode. You just have to go with the flow with this kind of TV and not concentrate too much about any holes in the plot, unless they border on the just plain stupid. Gabrielle Drake also being in it helps a lot too. Yep, I can't agree more, even though she did not like doing this episode. This is one of those episodes I loved watching right from the start. The pace never lets up. In which way did she not like doing it? Was she a proper thespian who thinks TV is not a proper platform for her creative talents? Something I found out about her today by chance, she is the Sister of Nick Drake, the singer/songwriter who committed suicide tragically young. In which way did she not like doing it? She said she didn't agree with the ideals of the show (fight fire with fire) and also found it a bit too violent. Apparently, Sarah Douglas (Dr. Ross in Wild Justice) was initially approached to play Julia. I don't think she would have minded the content of the episode. I don't get why actors and actresses think too much about the parts they play. I think I remember Martin Shaw speaking in the 1996 Profs documentary about having issues with scripts and Gordon Jackson would tell him "Just say it laddie" or words to that effect. Good on Gordon. So to speak, he was a true professional. Martin was just too critical of the show. On the other hand, Lewis was enjoying every minute and rightly so. 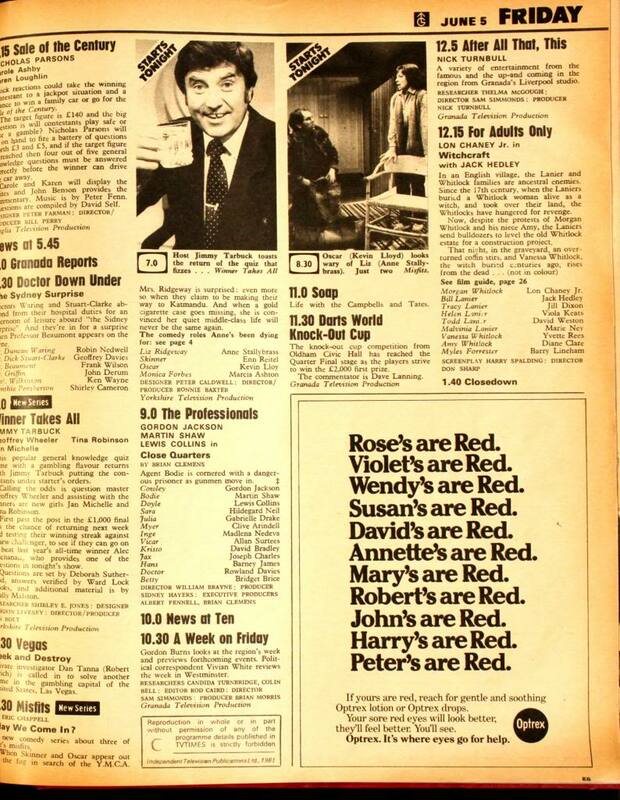 Back in the 70's these parts were handsomely paid - so a lot of the time the parts were taken despite what 'they' thought of the show in the coming years. Even directors hated it - Francis Megahy who adored working on 'Minder' didn't like his time on 'Professionals'. However a £5-6,000 wage for 10-days work in 1977 was pretty good going. Yep, that was a generous payout. On the 1st series, they used quite a few veterans like director Charles Crichton who worked on Man In A Suitcase. Luckily, by the 2nd series, they had a new producer and went for fresh new directors like Martin Campbell. Don't like that episode...all too coincidental and why does bodies hand bleed when he holds the gun? He didn't have an open injury in the first place, did he? The only episode I can remember where one of the cars is actually mentioned by name: Cowley says Bodie took a Capri pool car...or sth. Normaly they seemed to avoid naming Ford and the models, they only refer to the cars. A fine showcase for Lewis Collins and Bodie. I think that cancels out the minor faults in the episode. However a £5-6,000 wage for 10-days work in 1977 was pretty good going. Did actors really get paid this amount back in 1977? I honestly thought this type of fee would have been in the hundreds. If anyone knows, what sort of figures would the likes of Shaw, Collins or Jackson, got for appearing in the entire series? Good to see Cowley briefing a group of agents. Always nice to see other members of CI5 since it adds to the realism of the show as a whole. Being in America I only know Gabrielle Drake from UFO so it's fun to see her in a different role. She looks good as a Ginger! The terrorist gang makes up with ruthlessness what it lacks in numbers. They are certainly committed to their leader. Even with just one good hand Bodie is still highly dangerous. He also gets to be resourceful which makes for nice characterization. 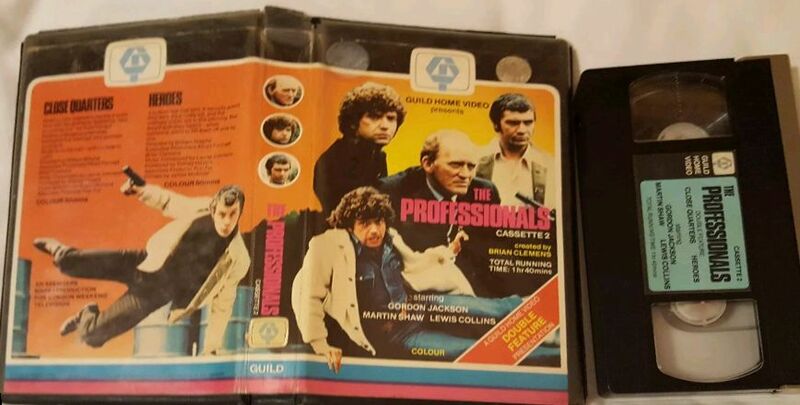 Good action scenes and a fine showcase for Lewis Collins as Bodie. Bodie spotting the terrorist may be coincidental but I just chalk it up to dramatic liscense and it doesn't effect my enjoyment of the episode. We also learn in this episode that Doyle and Bodie have been a team for two years and three months. I'm having fun watching the first year again and not just because it's on Blu-Ray. I'd forgotten how many great episodes there are out of the first thirteen. I'm avoiding the descriptions and waiting to read the Viewer's Notes until I've seen all the episodes. Some episodes I can remember the plots by the titles and others I don't. I can't add anything more but agree it's a classic. Brian Clemens must have worked incredibly hard getting all these scripts in in a short space of time. Watched this again and I would have to say that it does have its strong points. It is a very well-written, taut action/siege story and rates highly in that genre. However, I agree that is does rely a bit too much on coincidence and - I know you do have to go with the flow a bit but still - he puts everyone in danger with his gung-ho approach and his bandaged hand especially poor old Gabrielle Drake who has to out row the speed boat, not to mention the housekeeper and the mad vicar who climbs out the window. I think the terrorists are all very well played, especially the one he keeps as hostage and the woman, interesting to see the fellow who turns up years later in the Harry Potter franchise who I don't think gets to speak. The other thing that bugs me a little is the unlimited amount of ammunition he seems to carry with him and which he loads from one weapon to another which even if it was the right calibre would certainly jam given the way he sticks it in the magazine. But still it is entertaining. the wrong way round ! Note the registration of the Cortina estate - SLE16R - the same sequence as a famous Capri !!! Kelly Monteith in his BBC2 series around 1981/2 ? I agree with the majority on this one - whatever flaws it may have regarding convenient coincidences , it is a very good action packed episode where Lewis gets to shine brightly and cement his leading man credentials. I remember the Kelly Monteith show too ! VHS forever, 'Close Quarters' & 'Heroes' ... love it. I wonder how the prints compare to the versions that ITV4 show? I believe they were created when they were ‘digitalised’ in the early 90s. Is the David Bradley that appeared in this episode the same one who played William Hartnell and The First Doctor in the 2017 Doctor Who Christmas Special? Certainly my favourite episode from series one. The idea for a European terrorist group being tracked and the lead member being caught chimes with that period. Most of series one is hit and miss, and Close Quarters is certainly a good effort. And it's the first episode I can recall seeing when it was originally broadcast.